November through April is a great time to head out into the fiord inlets of Clayoquot Sound near Tofino and pull the prawn traps. 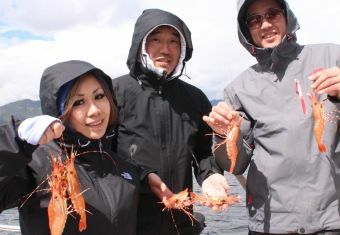 Spot prawns are fantastic table fare, you can saute them in butter and garlic or eat them raw with soya and Wasabi. 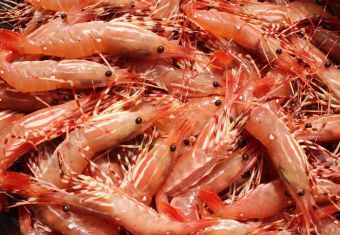 However you like your prawns a sportfishing charter is the only way to get fresh BC Prawns prior to the commercial opening in May. We are set up with a power prawn trap puller. You are welcome to help out as much or as little as you like. 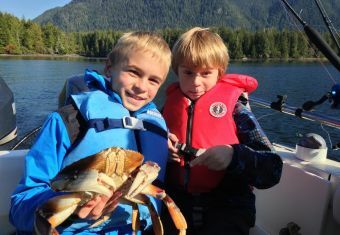 Dungeness Crabs while available year round in the Tofino harbour, are particularity abundant during the winter months. Pulling the crab traps is interesting and entertaining for the whole family and can be quite productive. Trilogy Fish Company can steam your crab at their dockside shop or you can take them back to your place and boil them up. Salmon fishing or Rockfish jigging can be incorporated into your prawning adventure. Typically we fish through a slack tide before or after we check the traps. Winter Chinook Salmon are, in our opinion, the best eating fish in the North Pacific. Gorging on krill during the winter months makes these salmon a delicious treat. Winter salmon halibut and bottom fish charters - When the weather breaks and the seas lay down and we are able to access the offshore waters for feeder Chinook Salmon and bottom fish. Halibut, lingcod and rock fish are good options when open to fishing. Halibut open until Dec 31st 2015, likely opening April 1st 2016. Lingcod closed November 16th 2015 - March 31st 2016. Rockfish open year round. Please give us a call or an email if you would like further information or would like to set up a charter. Winter pricing available.